Established in 2002 by Laura, Occasions offers hire at affordable prices. 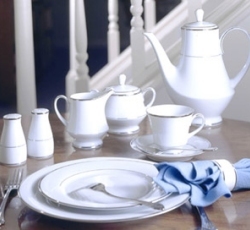 The range of hire includes crockery, cutlery , glasses, linen, tables & chairs and 6 burner LPG range. Occasions supply to all events, family parties, weddings, and corporate. Wash up service: you can return your order to us dirty for an extra charge. Delivery service: covers Milton Keynes and surrounding areas. Collection/return: orders can be collected and returned to our warehouse by appointment. Richard Bryce, Laura's husband, is the proprietor of R&R Marquees and has run a successful marquee and party tent hire business since 2000. Richard has accumulated a number of very useful contacts within the tableware and marquee hire market and has a wide knowledge of various local catering and hire businesses. Thanks to Richard's expertise and professionalism, R&R Marquees has developed a highly respected reputation as one of the leading marquee hire companies in the Milton Keynes area. With just one phone call to Occasions or R&R Marquees, whether it be a small meeting, a wedding, or any other function requiring the hire of tableware, tables, chairs, linens,party tents or marquees, we will be happy to advise on the complete package to enable your function to be stress free and a memorable success!